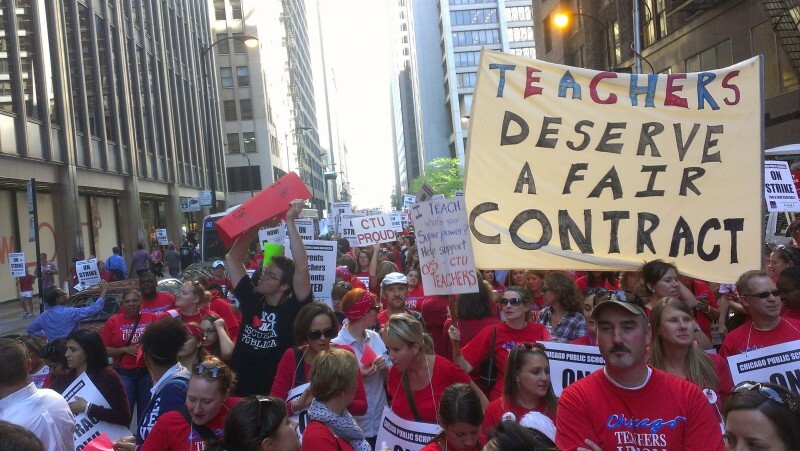 30,000 teachers in Chicago strike | Fight Back! Chicago, IL - On Sept. 10, Chicago Teachers Union Local 1 went on strike after ten months at the bargaining table. They tried to use negotiations with the Chicago School Board to defend their jobs and the interests of their students. When the Chicago Public Schools refused to back away from their corporate agenda, CTU members had no choice but to strike. Picket lines were formed at over 600 schools and anyone driving the streets of Chicago on Monday morning could see that the pickets were strong. Emanuel and the media tried to make it appear that the CTU is unreasonable. According to School Board President David Vitale, the school board made major concessions. He claimed in the press that the teachers were overpaid and yet he was offering them big raises. But the school board violated the binding contract with the teachers when it refused to honor the 4% raise in the last year of the old agreement. The measure of his generosity has to subtract the wages lost when he violated the contract last year. The real story in this conflict is that public education has been under attack by corporate-backed politicians like Emanuel. Teachers unions are facing the fiercest assaults by both the Republicans and the Democrats because they are the only strong defense that students have. “There were more kids on our picket lines than in the Mayor’s contingency schools,” noted Chambers, indicating more parent support for striking teachers than for the CPS. Parents support the CTU because the union fought for both their jobs and the kids. The strength of the union defeated plans to make teachers work longer work weeks than the current 58 hours; they defeated Emanuel’s plan to have them get pay raises based on improvements in test scores; they won back math, science, music and art classes, and recess for their students. Only when they couldn’t stop the attacks through bargaining did they call a strike in order to continue the fight. After the 30,000 union members picketed all day, 20,000 of them and their community supporters marched on the headquarters of the Chicago Public Schools in downtown Chicago starting at 3:30 p.m.